Wi-Fi networks are miraculous and devilish at the same time. They can seem miraculous in their ability to deliver high-speed network and Internet communication through walls and ceilings, and over long distances. But they don't always deliver the speeds they promise. When you're troubleshooting a slower-than-it-should-be network, the devil is in the details. The most common reason for an underperforming wireless network is interference, which can crop up when competing wireless signals disrupt the transmission of data on your network. Interference means bits have to be resent or sent at a slower speed. It can also mean that network throughput drops to zero or that devices lose their connections to your base station. In real-world usage, if you have a Mac using 802.11n Wi-Fi to connect to a computer or router with a wired Ethernet connection, and they're both in the same room, you should routinely see speeds of 20 to 70 Mbps in the 2.4 GHz band and 30 to 150 Mbps in the 5 GHz band. (Between two Wi-Fi devices, speeds will naturally be half, because the same data is being sent twice.) If you're regularly seeing speeds below 20 to 30 Mbps in either band, this article is for you. Here's how to find out what might be interfering with your wireless net and then to make sure you're getting the highest rates you can. Wi-Fi uses two unlicensed spectrum bands (hunks of frequencies reserved by regulators for low-power devices) to send and receive data. The 2.4 GHz band (which Wi-Fi equipment has been using since 1999) is called a junk band, because it’s shared by so many different kinds of equipment: medical monitors in hospitals; industrial sealers; home microwave ovens; Bluetooth devices; baby monitors; cordless phones; older wireless keyboards and mice; and on and on. So if your Wi-Fi equipment is using the 2.4 GHz band, its signals will have lots of competition. There’s less competition in the 5 GHz band. The laws of physics demand that a 2.4 GHz signal travels farther than a 5 GHz signal using the same amount of power. The laws of nations put further restraints on devices that use the 5 GHz band, limiting signal strength often to a level lower than than allowed in 2.4 GHz. Those two factors can reduce interference (neighboring networks are less likely to get in the way because their signals don’t reach far enough to interfere), but they also means you can’t get the best speeds in 5 GHz more than a couple rooms away. Interference doesn’t come just from competing sources; it also comes from overlap. The 2.4 and 5 GHz bands are both split into channels that are about 20 MHz wide. In the 2.4 GHz band, those channels overlap at 5 MHz intervals; that means that (in the United States) only three of the eleven available channels—1, 6, and 11—largely avoid crossing into adjacent channels. (Other countries and regulatory regions allow more or fewer channels.) Because there are fewer channels to choose from in 2.4 GHz, signals from nearby networks can bump into your network, reducing speed. In the 5 GHz band, each 20 MHz channel butts right up against the next with no overlap. Apple 802.11n gear is designed to use eight non-overlapping channels. (There are 13 other channels in the 5 GHz band that Apple doesn’t use, because of regulatory and interference issues.) Additionally, Apple’s hardware can bind two of those channels together into a so-called wide channel, to double your bandwidth. For starters, launch /Applications/Utilities/AirPort Utility and select your base station. Click Manual Setup at the bottom of the base station overview screen, then the Advanced view icon. Select Logs and Statistics at the bottom of the screen and then the Wireless Clients tab. There, you can see which devices are connected to your base station, as well as assessments of those connections. Signal and noise are measured on a scale that uses negative numbers to denote the weakest levels; the further a number is below zero, the weaker the signal or noise. With signal, stronger is better, so you want a number closer to zero: -25 is far stronger (and a typical value to see) than -50. You want noise to be as weak as possible, so you'd rather have a noise measurement of -90 than -50. Both are measured on a logarithmic scale: an increase or decrease of 10 is a tenfold change. The Rate field shows the current connected rate in Mbps; that can range from 5 to 270 depending on the band and device. Type shows the kind of connection that’s in use: 802.11b/g or b/g/n means the device is using the 2.4 GHz band; 802.11a/n means a 5 GHz connection is in use. To find out what might be causing network slow-downs, start by checking to see how well each client is connecting to your base station. When you see a high amount of interference in the form of a high noise number or a lower than expected rate for one of those connections, you need to identify potential culprits. To find out if the problem is a nearby wireless network, download and install iStumbler (donation requested); make sure you get the correct release for your version of Mac OS X. That utility provides a list of all the networks that your Mac’s Wi-Fi adapter can sense, and the channel each one is using. Assuming you do find a nearby wireless network that’s using the same channel as yours, you can try to change the channel your base station is using. The easiest way to do so is to restart your router. When you first start an Apple base station (as well as Wi-Fi routers from many other companies), it automatically chooses the channel that’s least used at that time. Restarting it forces it to pick a new channel, which could solve the problem without making you muck about with settings. But the choice your router makes may not always be best. And even if its initial choice is a good one, if you leave it on for months at a time, that choice may no longer be the right one. You could reboot the router again. Or, to make sure you get the channel you want, you could select it manually. In AirPort Utility (/Applications/Utilities), select your base station, click Manual Setup, and click the Wireless tab in AirPort view. On a 2007 or 2008 AirPort Extreme, AirPort Express, or Time Capsule, select a channel from the Channel popup menu. On base stations released in 2009 or later, first select Manual from the Radio Channel Selection menu, then click the Edit button. From the 2.4 GHz Channel menu, select a different channel. 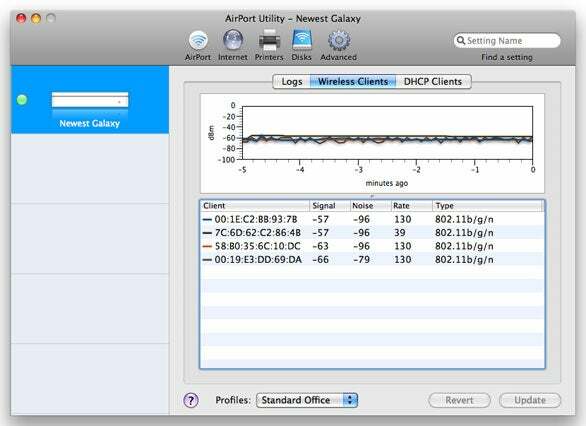 In the AirPort utility, you can manually select specific channels on the 5 GHz and 2.4 GHz bands. The specific channel you choose—with an exception in the 5 GHz band—isn't as important as picking one that's not in use by a nearby network. In the 2.4 GHz band, you want to pick from among channels 1, 6, or 11, whichever one is being used by the fewest nearby networks. If that channel still performs poorly, try one of the others. In the 5 GHz band, you can choose from any of the eight channels Apple makes available, but there’s a big difference among them that's worth noting. The four lower-numbered channels (36, 40, 44, and 48) use just five percent of the signal power compared to the higher-numbered channels (149, 153, 157, and 161). You can choose a low-numbered channel to reduce interference and range. Or you could select a high-numbered channel to boost range, even though that could cause interference with other nearby networks. Reducing interference can improve throughput if your base station is receiving signals from competing devices. Increasing range can do the same thing, if the problem is that you're trying to reach a distant device. You could also try moving the base station. If you can locate your base station somewhere further from outside walls or other homes or apartments (the sources of interference), give it a try. Finally, talk to your neighbors. It’s possible they’re having the same trouble. Perhaps you can agree to coordinate channel usage. Help them if they don’t know how to make changes; while you’re at it, you might turn on network security for them, if they haven’t done so already. If your wireless net is suffering from interference, but the Airport Utility or iStumbler have ruled out nearby networks as culprits, you need to consider other causes. For example, are you using older wireless hardware, such as a baby monitor, old Bluetooth equipment (more than three or four years old), or a non-standard wireless keyboard with a USB dongle? Do you have a 2.4 GHz cordless phone? Even if you don't have any of those things, they could still cause problems if your neighbor does. The first troubleshooting step is to eliminate as many possible causes as you can. Turn off every non-Wi-Fi wireless device you have, then check your network speed. If the problems go away, you may need to get rid of the offending item. If it’s your phone, note that new 1900 MHz DECT6 cordless phones are cheap, work well, and don’t interfere with either 2.4 GHz or 5 GHz Wi-Fi. You could also try switching bands, as above. If the problem is with another device that uses the 2.4 GHz band, moving to 5 GHz could solve it. Finally, if the problems persist, you could have a problem with your Wi-Fi radio itself. If you can’t duplicate the problems with another computer, look into warranty repair; document all the troubleshooting steps you’ve tried, because even Geniuses might not believe the radio is at fault. I receive hundreds of e-mails a year from Mac users about troubleshooting their Wi-Fi networks. In most cases, the advice above helps. But sometimes I encounter a case that no amount of reconfiguration will fix. Some of this clearly has to do with interference—in the 2.4 GHz or 5 GHz band—that’s outside of the control of the user or his neighbors. For example, I had a year or two when some massive unknown interference-source near my Seattle office was causing problems with Channel 1 in the 2.4 GHz band. No amount of tweaking would get more than a few kilobytes to dribble through per second. If you suspect that you might have some kind of mysterious source like that, and if you don’t mind the investment, you could buy a device that scans the spectrum for signals—not just those produced by Wi-Fi, but all emissions. 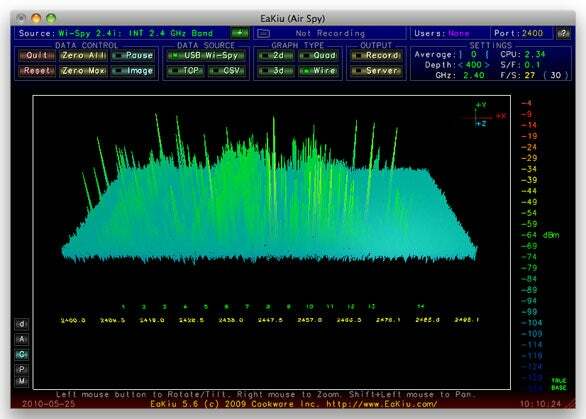 MetaGeek offers their 2.4 GHz Wi-Spy 2.4i software-plus-USB-dongle combo for $99. Wi-Spy can help you find neighboring causes of wireless interference. Getting a Wi-Fi network to run at something close to its top speed isn't quite a black art. But it is remarkable how often plug-connect-and-surf just doesn’t work. It's also remarkable how often Identifying, isolating, and working around a source of interference can solve the problem. Updated at 4:40 PT 5/26/10 to clarify signal/noise numbers and add some general guidelines re: speed.